The weekend before Thanksgiving, Don Geary and Bill Rountree reinstated the annual turkey shoot down at the dump south of Baker. This had been a long-time fundraiser for the local EMTs, but was discontinued seven years ago for various reasons. This year they were ready to try it again, and enthusiastic sharpshooters turned out despite the cold weather. The funds this year benefited the Great Basin Water Network to help protect Snake Valley's water. The shoot consisted of many categories, and after each round, participants checked how they did. Whoever won that round won a turkey. It was interesting seeing the different guns folks had. The kids got involved, too, and there was even a special class just for them. To make the day even better, refreshments were available. Hopefully next year will bring an even bigger crowd to this fun Snake Valley event. Get ready for Christmas and support local crafters today at the Border Inn Craft Fair. It's from 1-5 pm (PDT). Quite a few crafters are expected. Some local groups (4-H, Community Center) will also be raising money at the event. Here are some photos from last year's craft fair. It's that time of year to start planning for 2014, and what better way to plan than with a beautiful 2014 Snake Valley Calendar! Every month enjoy a stunning scene from Snake Valley. Calendars cost $15 each, 2 for $25, or bigger quantities at a discount. You can buy them at the Border Inn or from Susan Wetmore. Susan is able to send calendars by mail (approximately $3 s&h for 1 calendar and $5 s&h for 2 calendars). You can reach her by email: sywetmore @ wirelessbeehive.com or phone: 775-234-7265. Proceeds go to the Great Basin Water Network to pay legal and specialist fees to help keep Snake Valley's water in the valley. You can learn lots more about the wonderful features of Snake Valley on the Protect Snake Valley website. Great Basin National Park is officially closed during the Government Shutdown, which means no entry. That's a bummer with the fall colors changing, not to mention that the Lehman Caves Cafe had to shut a week early (and their employees unexpectedly had a week less of pay), and all the visitors that have traveled near and far now have to figure out what to do. Fortunately Snake Valley has a treasure trove of wonderful things to do in it. We are blessed with many beautiful and interesting places. Here's a list of the Top Ten Things to Do in Snake Valley. Baker and Garrison schools had their annual wheel-a-thon in mid-September. Despite some morning rain showers, the rain eventually stopped (or rather paused--we got more in the afternoon), allowing for most of the wheel-a-thon to happen in nice weather. 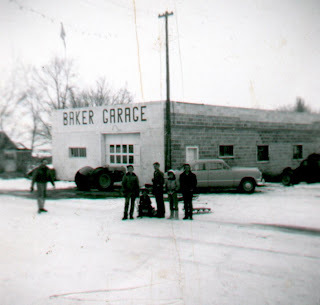 The Baker kids rode from Highway 6 & 50 to Garrison and back (16 miles), while the Garrison school kids rode one way (8 miles). The kids got a snack break at each mile. Even though many of these kids don't ride their bikes frequently, they all made it the whole distance. Way to go! They had friends and family pledge money per mile for the school. For more about the Wheel-a-thon, check out Jenny's blog! EskDale held two wonderful summer concerts in addition to the Fourth of July bonanza. These concerts are always a joy to attend, with a variety of musical talent showcased. Above, Sharon delights the crowd with a comical song--where she finds these gems, I don't know! Lois always plays something fantastic and makes it look so easy! If you missed these concerts, or even if you didn't, be sure to put December 12 & 13 on your calendar for more EskDale music, with the Christmas banquet and production. Looking forward to that makes it easier to handle the colder temperatures and shorter days! Part of the excellent dinner--the baked potato and roll didn't fit! Melissa was part of the awesome behind-the-scenes crew that made it all happen. Thanks! To see more photos, check out the SVVFD's Facebook page. Thanks to everyone who came and helped at the BBQ! Unfortunately it's harder to get the data for north Snake Valley. When I tried Partoun, Trout Creek, and Callao, I got a return with something out of state. When I used zipcode 84083, the result is 1516, but this includes West Wendover. Maybe someone else knows how to find that data. For zip code 89311, the median age is 47.9, and 79.3% of the population has attained high school education or greater. The number of veterans who live here is 26, 0% of the population lives below the poverty level, and 0% born in another country. Of course, all this data should be taken with a grain of salt, as it says we have 0% Latinos in the community, and we know that certainly isn't true. For zip code 84728, the median age is 36.0 (wow, such young'uns just on the other side of the state line! ), with 62.0% holding a high school diploma, 0 veterans, and 26 foreign born. For both zip codes, no children had been born within the last 12 months, according to the data (although a look around the community shows that 2009 and 2010 produced a good crop of kids). I spent some time trying to find older census data, but got frustrated with being led in circles around the Internet. If you know how to compare how these areas have changed populations over the years, please leave a comment. I did find lots of numbers from other web sites about the populations that didn't match what the census data said. One site said that Baker's population was 154, and it probably got that number from another site that ranked Baker as the 154th largest town in the state of Nevada with a population of 235. Well, there might not be many of us out here (I think the population density for the 89311 area code is 0.1 people per square mile), but we are still here! Great Basin National Park recently held an Arachnid BioBlitz to learn more about the spiders, scorpions, mites, and ticks that live in the park. The three-day event attracted scientists, naturalists, and a few arachnophobes. However, even those scared of spiders gained a new appreciation for them. Some Snake Valley residents even tried holding a spider! For more on the BioBlitz and what was learned, check out this Ely Times article. As part of the Snake Valley Festival, the first-ever Mr. and Ms. Snake Valley Pageant was held. Aileen organized the event into four age groups: 0-10, 11-20, 21-60, and over 60. To compete, each contestant had to compete in formal and/or outdoor wear and do a talent. Oh yeah, it cost a $1 to enter. Here are the winners for the kids age group: Matthew and Ava. They loved their crowns! All the kids who participated got prizes. One of the talents: a somersault. In the older categories, one talent was to put up a tent in a minute. I think I forgot to mention that the talent was limited to one minute and could not include singing, dancing, or playing a musical instrument. That made for some entertaining talents! The winners for the teen category: Zeke and Tori! Zeke won a cool snake belt buckle and Tori won a manicure from Buffy. Joseph won Mr. Snake Valley and a $25 gift certificate from D-Bar X Meats. There was a tie for Ms. Snake Valley: Gretchen and Carolyn. Prizes were a free lunch to Lehman Caves Cafe and a massage from Jenny. It was getting too late for the Senior Mr. Snake Valley, so Tom had to accept the prize for his dad, a book donated by Range Magazine. And no Senior Ms. Snake Valleys competed--ladies, come give it a try next year! Thanks to all the sponsors and to Aileen! It was a really fun event, and plans are to include it again next year. There's plenty of time to practice that one-minute talent! Ely – The Bureau of Land Management (BLM) Ely District wants residents of Baker, Nev., and Garrison, Utah, to be aware that they may occasionally see smoke from the 350-acre Black Fire that is burning on public lands in Black Canyon, about three miles southeast of Great Basin National Park within the Highland Ridge Wilderness. The lightning-ignited fire poses no threat to human life or property. The BLM is managing the fire in accordance with the Ely District Managed Natural and Prescribed Fire Plan, which identifies areas where allowing wildland fire to resume its natural role in the ecosystem would benefit resources. The plan increases native vegetative diversity and improves wildlife habitat. It also increases public and firefighter safety, and reduces the threat of catastrophic wildfire. 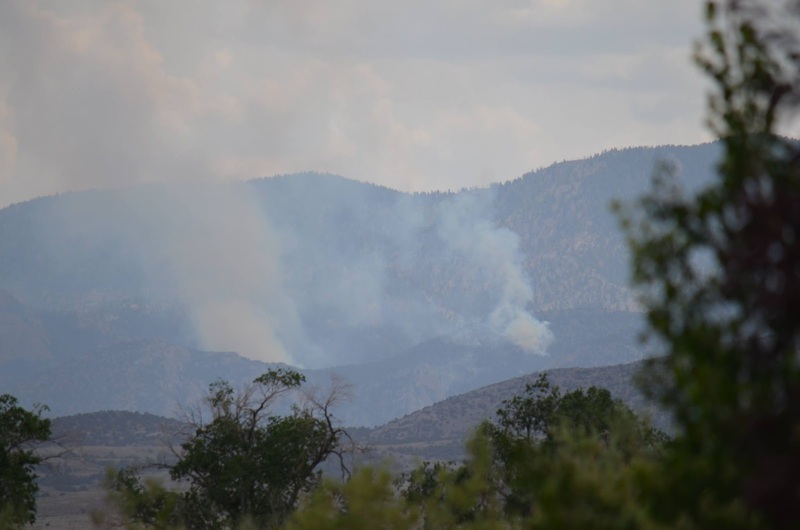 Assisting the Ely District is the Unaweep Wildland Fire Module (WFM), of Grand Junction, Colo. The Unaweep WFM is a 7-person crew that supports national interagency programs with the use of fire, including prescribed fire and wildfire, and hazardous fuels reduction and other projects. For more information, contact Chris Hanefeld, BLM Ely District fire information officer, at (775) 289-1842 orchanefel@blm.gov. Summer school was in session this past week in southern Snake Valley, with quite a few kids attending. They worked on some school topics, had recess, snack, and then a special presentation each day. For one presentation, a student was turned into a spider with eight legs, eight eyes, and special mouthparts called chelicerae, which deliver the digestive juices into the prey so that the spider actually starts eating its meal before it even ingests it. Then it was time for the students to take turns being flies. They tried to get through the spider's web without vibrating the strands, which would alert the spider of a nearby meal. All on their own, the kids located a spider web and spider outside on the school building. Then it was on to playground physics, learning about gravity, momentum, and friction. Above, a magazine and a cardboard box are being tested to see which has the least amount of friction. The students repeated the experiments several times (well, enough so they could all go down the slide!) to decide the winner and see if their hypothesis was correct. Then it was time for more friction experiments to see which round object would reach the bottom first. It was hot, but it was a fun day! Thanks to all who helped make summer school a great time!